I've just returned from six weeks in the United Kingdom, visiting my wife's family and many of our friends. I had planned to spend a great deal of my time doing photography, but we all found ourselves ill for most of our visit. Despite this, I still managed to get out a few times. This included an evening on Cape Cornwall, a visit to Plymouth harbor, a morning and evening at Bristol's Clifton Suspension Bridge, two days in the beautiful Lake District and a very rainy week in the stunning highlands of Scotland. You can see some of the highlights from the trip here or see all 65 new images by visiting the relevant galleries: Cornwall, Devon, Bristol, Lake District, and Scotland. 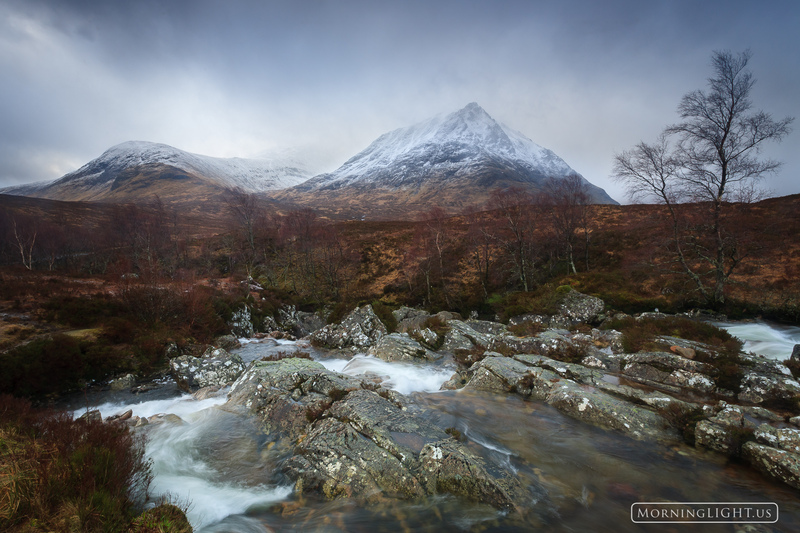 A very windy and rainy morning on Rannoch Moor at the beginning of Glen Etive in Scotland. Photo © copyright by Erik Stensland. 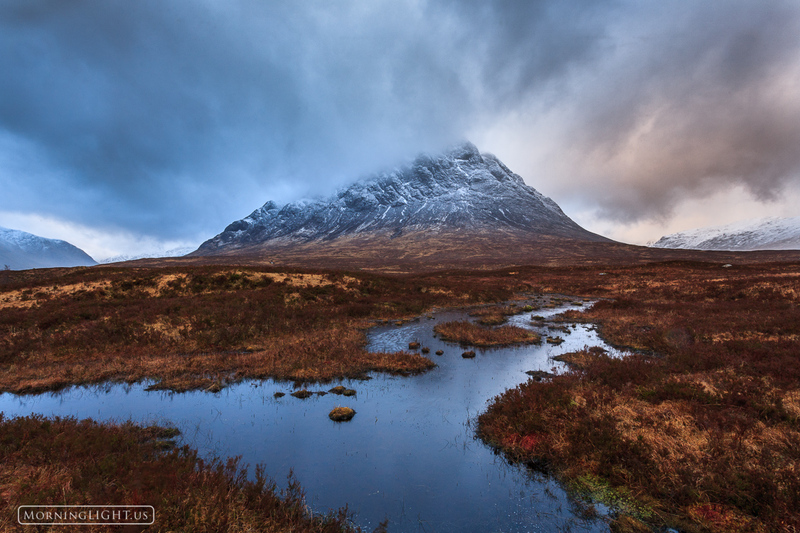 This was my second attempt to capture an image of Buachille Etive Mor on Rannoch Moor in Scotland. Again, the rain was falling hard and the wind was blowing towards me from the mountain. I used a clear shower cap to cover the lens while I composed and then quickly took it off to take my shots. Within 1 second, the lens would be covered in water spots. Ugh! This was probably my favorite image from the trip to Scotland, but upon closer inspection I found significant water streaks on the image. If you are interested in larger sizes of this image, let me know and I can try, but it will take a bit of work to deal with the areas blurred by the water. Photo © copyright by Erik Stensland. The sun came out for a while on this day allowing us to shoot the beautiful and iconic Eilean Donan Castle on Loch Duich in the Scottish highlands. Everything was perfect except for the fact that we were there off season and so work was being done on the castle. Since this was my only opportunity to shoot this castle in good light, I broke my normal approach and shot it with the distractions and then removed a person and a vehicle using Photoshop. Despite the removal of those, this is a photo which contains a great amount of detail and will look stunning as a panoramic print. I look forward to displaying it later this year in Estes Park's Scottish festival. Photo © copyright by Erik Stensland. A fast moving storm over Upper Loch Torridon in the Scottish highlands with the imposing Beinn Allgin peak in the distance. Photo © copyright by Erik Stensland. 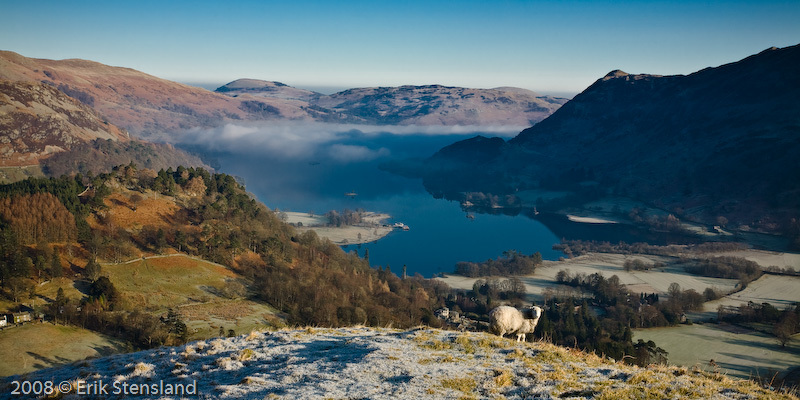 A lone sheep stands on a frost covered hill high above a partially cloud covered Lake Ullswater in England's Lake District. Also available in standard (non-panoramic) sizes up to 30x45. Contact me if you prefer a standard format. Photo © copyright by Erik Stensland. A beautiful evening as the sun sets behind the Clifton Suspension Bridge in Bristol, England. This bridge is one of the classic icons of the Uk's south west and this evening it looked beautiful. 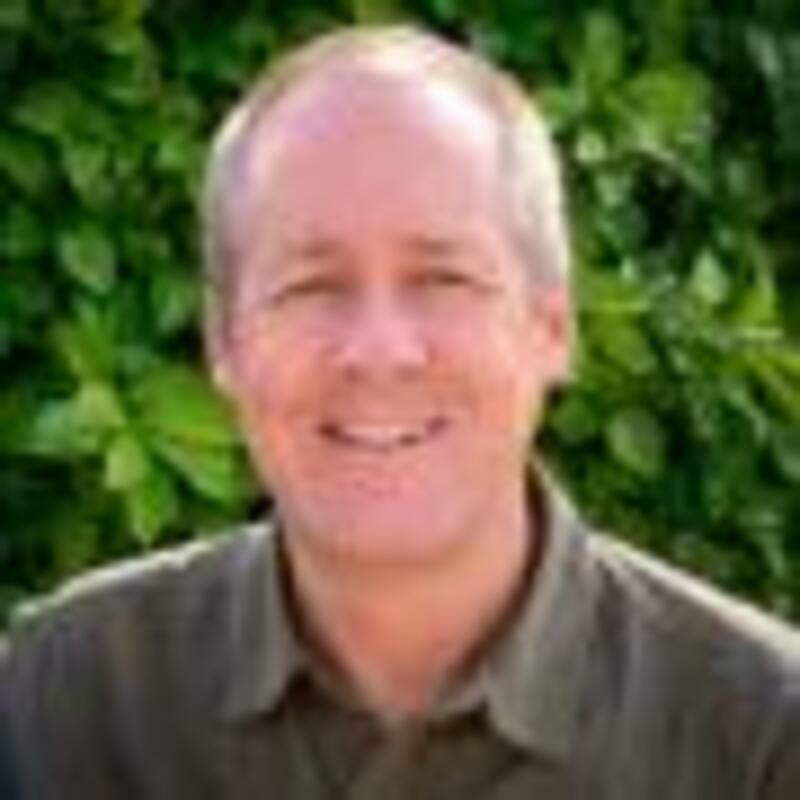 (Note: This image is also available in standard sizes. I also had to add this ugly copyright watermark to the images of Clifton Suspension Bridge as this one is regularly taken illegally for use in Bristol websites.). Photo © copyright by Erik Stensland. Sunrise and fog at the Clifton Suspension Bridge in Bristol, England. (This is also available in standard, non-panoramic, sizes.). Photo © copyright by Erik Stensland. 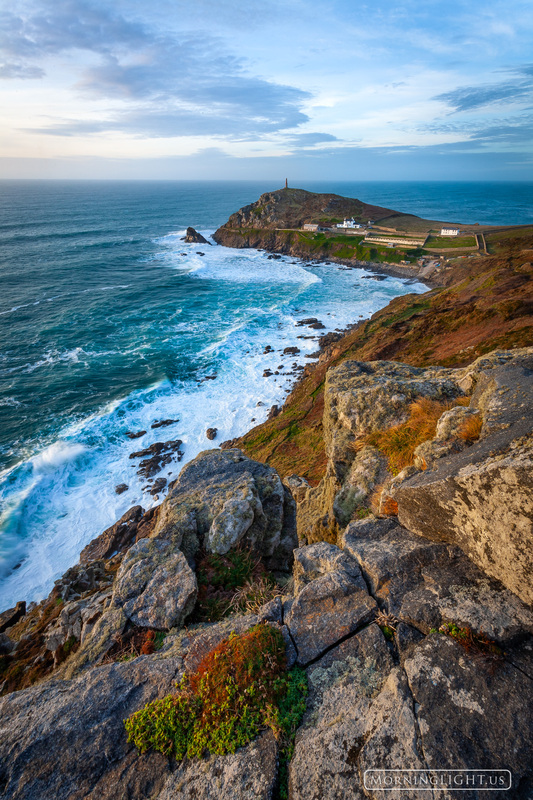 I stood for nearly an hour on this cliff over Cape Cornwall waiting for a dramatic sunset to light the cape, but it never happened as the sun went behind the clouds just before sunset. This was the best light I had this day, but it was still very nice. Photo © copyright by Erik Stensland.